EXECUTIVE ACCESS: WaterSound guests staying at this property have complimentary access to the WaterSound Beach Club, 3 community pools (including the 7,000 square ft zero-entry pool at the WaterSound Beach Club), the use of two kayaks or canoes for one hour per day, as well as 20% off stand up paddle boards at the WaterColor Boathouse. For an additional cost, they also gain full access to Shark's Tooth and Camp Creek Golf Courses, the WaterSound Fitness center, and 2 tennis courts at both Shark's Tooth Club and the WaterSound Beach Club. DETAILS: “Here Comes the Sun” can only be described as a masterpiece of design. 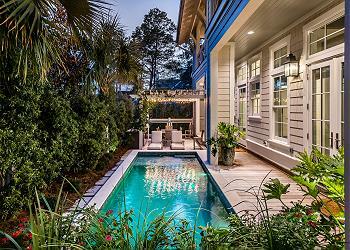 This newly constructed 5-bedroom, 6.5-bath coastal getaway features a private pool, staggering Gulf views, a crow’s nest and a carriage house. From its chef’s kitchen to its Nantucket-inspired exterior to its amazing outdoor spaces, it has to be experienced to be fully appreciated. Enter through the front door and step into the living room with its gorgeous box beam ceiling, near-floor-to-ceiling windows and custom hardwood floors. The gourmet kitchen offers custom cabinets, select stainless appliances and granite countertops. Most remarkably, oversized French doors give onto the pool area which serves as the focal point of the outdoor space. Just off of the pool area is a screened-in porch with a fireplace and an outdoor gas grill. The kitchen also gives onto the dining area with seating for 8 while the counter offers additional seating for 4. The living room offers a fireplace, a vast flat-screen television and plenty of comfortable seating, making it the perfect place to take in a movie with family and friends. The master bedroom is just down the hallway and has a king bed and a private bath with a shower only. Ascending to the second floor, you’ll find a second master bedroom with a king bed and a private bathroom with shower and a tub. Adjacent is a guest bedroom with a king bed and a private bath with shower only. Next door is another guest bedroom, also with a king bed and a private bathroom with a shower-tub combo. Ascending the staircase to the third floor, you’ll find a guest bedroom with two twin-over-twin bunkbeds and a shared bathroom with shower only. Adjacent is another guest bedroom. The carriage house over the garage features a cozy living space, kitchenette and a guest bedroom with a king bed and a private bathroom with a shower only. 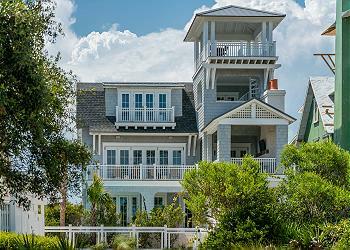 Presiding over this gorgeous coastal getaway is the crow’s nest with transcendent views of the Gulf. It’s the perfect setting to gather with loved ones over a sundowner. Two golf carts will whisk everyone around WaterSound with the beach just a few seconds away! “Here Comes the Sun” comfortably accommodates 14 guests. Call 360 Blue to book this spectacular retreat today!